A Digimon Baby which envelops its whole body with a smoke-like vapor. It is a unique Digimon whose computer kernel (Digicore), said to be at the center of a Digimon's body, is bare, so it seems it protects its Digicore with Smoke. Because its Digicore is bare, Mokumon is a Digimon of an unusual way of life which covers its body in Smoke from when it was burned. It scatters the Smoke issuing from its body all around, then seizes the opportunity to flee. A Digimon baby which always envelops its body's surroundings with a smoke-like vapor. It is a unique Digimon whose computer kernel (Digicore), said to be at the center of a Digimon's body, is bare, so it seems it covers its Digicore with Smoke in order to protect it. Because the Smoke was generated when its Digicore was burned, it seems it is harmful neither to Mokumon itself or to others. Also, because it is still in the middle of evolving, when it encounters an opponent it immediately flees. Then, it scatters the Smoke issuing from its body all around, and seizes the opportunity to escape when the opponent loses sight of it. As stated earlier, because it isn't particularly harmful, if you happen to see one it would be best to be quiet. n., From mokumoku 「モクモク」 which means "cloud of smoke". Anime/Manga Digimon Tamers: "The Mystery of Guilmon's Birth! 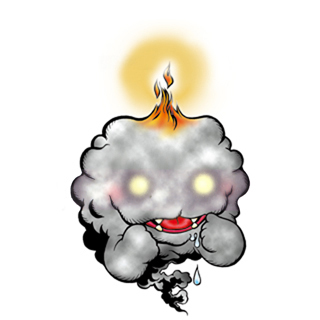 The Mystical Water Space"
Kemuri  ケムリ Kemuri Spreads smoke from its body to distract its foes and escape. 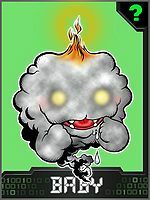 Smoke  スモーク Sumōku Spreads smoke from its body to distract its foes and escape. A group of Mokumon were employed by Shibumi as his helpers when his consciousness was in the Digital World. (His body was in the Real World in a coma.) One of the Mokumon shapeshifted to Shibumi's countenance to enter the Real World and sneak a "Blue Card", a card used as an activator for the main partner Digimon of this series to evolve to the Perfect level, into a boy's trading card deck. Yamaki chased the Mokumon, thinking it was Shibumi. The Mokumon disappeared into a pile of smoke, revealing that it was really a Digimon. Two other Mokumon were seen in Shibumi's library in the Water Space. A Mokumon was seen at Akiba Market. Mokumon is available as a Digimon Medal.